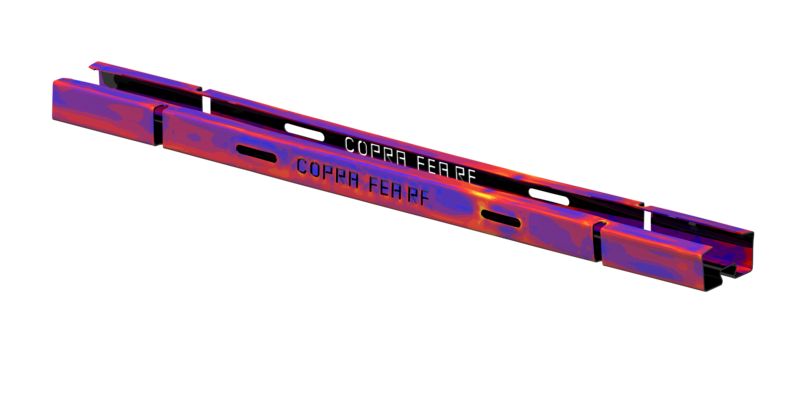 Our simulation software COPRA FEA RF rendes cost-intensive trial and error processes obsolete. The module calculates even complex rollforming operations with hundreds of stations as well as pre- and post-processing manufacturing steps reliably and fast. 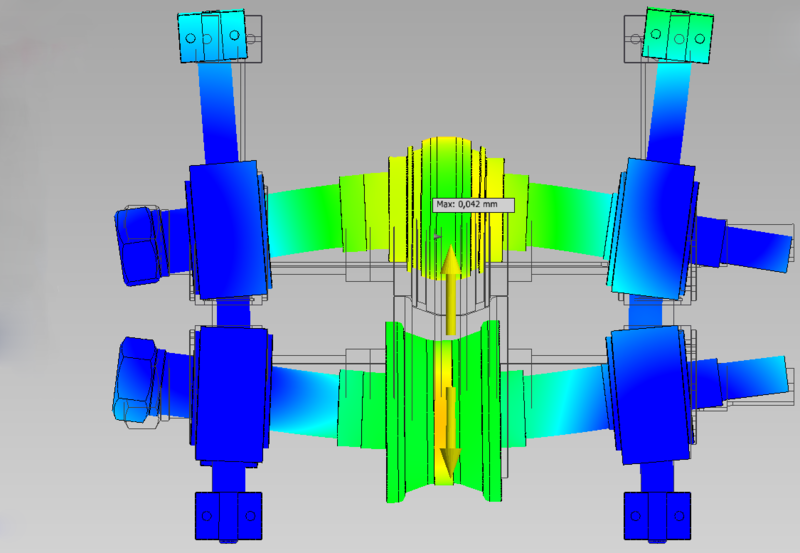 Model creation is fully automized - there is no need for a dedicated FEA specialist. To make life easy for the designer, the station stiffness can simply be defined during model preparation so that the roll gap will automatically be adjusted during the roll forming process, making the simulation results even more realistic. Using simulations based on finite elements it is possible to avoid not only costly defects and insufficient product quality. Intelligent collaboration with further COPRA software solutions allows simulation results to be immediately available for optimization and error correction in COPRA RF. If required, the flower pattern can be adjusted automatically. As a side effect, consistent simulation of the forming strategy generates valuable know how within the company. 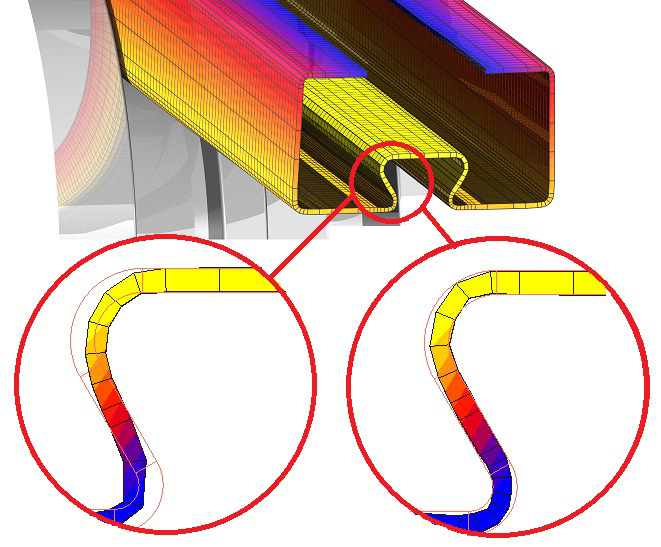 Material alterations during the rollforming process are often problematic for manufacturers ofprofiles and tubes, but do not pose a problem for COPRA FEA RF. Common defects likecorrugation of sheet edges, twists or other bends can often be avoided beforehand through verification. The quick and reliable simulation with COPRA FEA RF not only optimizes the rollforming process, but also reduces wearout of roll tools to a minimum. Using finite element simulations, the greater part of the implementation of a rollforming line can literally be conducted by the software. Consistent simulation also avoids machine downtimes and ensures a cost-effective process. Keep track of everything in complex forming processes: At the end of a simulation, COPRA FEA RF generates a dynamicanimation of the rollforming process and visually displays the results. This includes such crucial information like forming forces, driving torques as well as pressure and tension conditions. The data of the simulated cross sections will be automatically compared to the data derived from the design. Acomprehensive, three dimensional representation of the (virtual) product is also generated. Process simulation not only reduces expences for prototypes, roll tools and the commissioning of rollforming lines. Consistend and documented verification of design also generates valuable know how within the company.Quite a number of customers report medium-term cost reductions due to a more efficient rollforming process and reduced wearout of their roll tools.